The above info came from Kitty van Rossum, and was edited by yours truly (contact me). 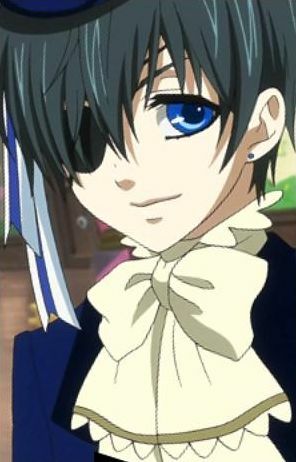 Ciel Phantomhive is a twelve years old boy. After the death of his parents he took over the company and became the head of the Phantomhive familly. The Phantomhive family is a royal family. They help the Queen with murder cases, when those are too big for Scotland Yard. Ciel has a fiancé. His fiancé Elizabeth is very different from Ciel. She's always happy and likes to renovate Ciel's mansion. He cares much about her although it may not seem like it. When Ciel was 9, he lost his parents in a fire. After that Ciel was traded as a slave. Because of that he has a symbol burned on his back. During all this Ciel lost most of his emotions. He doesn't know how to smile like he has fun anymore. Sebastian Michaelis, now his butler, saved him and made a contract. In Ciel's right eye is a pentacle. That's the same pentacle as Sebastian has on his left hand. To hide the pentacle Ciel has a eyepatch over his right eye. The above description came from Kitty van Rossum, and was edited by yours truly (contact me).